The Web Goes On Strike. Posted January 18th, 2012 by Karl & filed under Technology. A colleague of mine in the office recently questioned me why I haven’t yet written an article regarding the SOPA/PIPA story. It’s actually been a long winded saga between the lobbyists, the congress and the internet world with no clear indication on who the winner of this frivolous battle will be. That being said, a recent comment by Darrell Issa, committee chairman of the Committee on Oversight and Government Reform (which sounds terribly quango-istic), suggests that the congress will be shelving this proposal, at least for now. What confuses me a little though is why it took so long for the government to make any kind of official statement about the act. Their silence has only heightened the fear and doubt that a common-sense resolution of the problem could be attained in favour of the lobbying minority. So much so, in fact, that the aforementioned time period has enveloped a large degree of backing for it’s opposition; even from companies who initially supported the bill (even if it was only so slightly motivated by the loss of funds). You can actually view the list of current supporters for the opposition here but be wary, it’s a long and coveted list. Some companies have even gone as far as to provide a mini-example of what the new legislation could entail for the internet as a whole with scheduled blackouts of their sites. Wikipedia today has decided to go AWOL alongside other sites such as user-generated news site Reddit and many, many others. 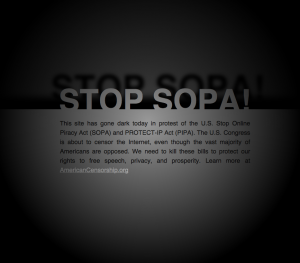 In fact, the website Sopa Strike even gave you links and code that you could use to create a blackout of your very own, and many have. In other news, RIM are to launch two new PlayBooks this year! You know, RIM. The company that made the Blackberry. That’s the one. CIO: SOPA Opponent Says Bill Stalled by US Lawmakers. BBC: GoDaddy faces boycott over SOPA anti-piracy law support. SOPA Strike: The Web Goes on Strike.